The Steelcase Company produces wall partitions in many finishes and designs. They are made out of durable materials to handle the assembling and disassembling of the cubicles as your needs change. The Steelcase Company's wall partitions are easily disassembled and rearranged to produce a different layout for to match the user's needs. Interlocking hinges slide apart to disconnect the wall partitions from each other. When moving from one location to another, the interlocking hinges should also be removed so that the wall partitions can stack neatly on top of each other. Steelcase cubicles can be disassembled to allow you to reconfigure your work space. 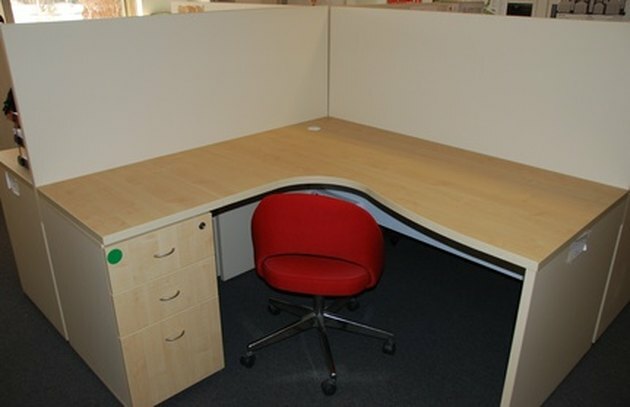 Remove shelving, furniture and electrical and telephone wires from the cubicle area. Untighten the interlocking hinges using the adjustable wrench. Life the cubicle walls upward a little to unhook the interlocking hinges on the wall partitions. Unbolt the interlocking hinges from the partition walls. Stack the partition walls on top of each other.